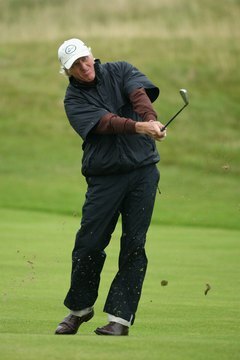 Even this far into his finish, Greg Norman's back knee stays bent so that his back foot doesn't slide. You might think sliding your back leg and foot during your golf swing is no big deal, that it merely indicates a good weight shift. You'd be wrong. Greg Norman says it actually lessens that weight shift. He worked with instructor Butch Harmon for two years in an effort to eliminate a sliding back foot that caused him to block shots to the right. If an unwanted slide is affecting your game, however, you might not need that long to get rid of it. Norman had a very upright swing. He swung the club so hard that he almost jumped into his downswing. If you have a similar problem, you might consider flattening your swing slightly. This is the hardest change to make, but you can try a variation of a method Jack Nicklaus used. When Nicklaus was a child, his teacher, Jack Grout, urged him to "reach for the sky" to help him get his hands higher in his backswing. Try using the thought of "reaching behind you" to get a similar (but flattening) effect. It's possible that you are straightening your back leg too soon during your downswing. Your hips have to turn toward the target as you strike the ball. Many players take a stance that's far too wide in hopes of creating more power; if your stance is too wide, your back knee will straighten before your hips have finished turning. If this is your problem, simply narrow your stance. Most players find that a shoulder-width stance – that is, imaginary lines dropped from the outsides of their shoulders would touch the insides of their feet – is about right. Even if your stance is the correct width, your back leg and foot will slide if your knee is too straight during your downswing. When you take your stance, flex your knees slightly so that you have a more athletic "bounce" to your stance. Try to maintain this flex throughout your entire swing – both backswing and downswing. This flex will allow a little "give" as your hips turn so that your back leg never straightens completely. Traditional advice often suggested that you should slide your hips toward the target to start your downswing. Players often were told to imagine their front foot touching the bottom of a wall and to slide their hips forward until they "bumped the wall." But this advice causes excessive hip movement. Watch almost any PGA Tour pro swing and you'll see that his forward leg is still short of perpendicular to the ground until well after the ball is gone. A good drill to learn this move is to take your address position but place your arms across your chest with your hands on your shoulders. Make a complete backswing and downswing while keeping your arms in that position. Your hips will stay between your feet, and you'll eliminate that rear leg slide.